Editor’s Note: This is the fourth in a series of five stories in honor of Teacher Appreciation Week. When I started junior year, I took AP U.S. history with the intention of dropping. I didn’t think I was going to do very well in the class, and I basically enrolled just to be able to say that I had tried. I had always loved history, but I just didn’t think I had what it took to do well in the class. After two days in the class, I talked to Mr. Matthew Wiemer about dropping. Nothing had even happened yet, but I was already so stressed about what could potentially happen that I wanted to quit. All the same though, I loved the jokes he made in class and how he incorporated fun stories into the lesson plan. He told me that if I was really worried about the class, honors U.S. history was a good option, but suggested I really try the class before dropping. I’ve never made a better decision in my life than staying in Mr. Wiemer’s class. Save our two-day tests, I had fun in the class almost everyday. When I was having a bad day, I could always count on his class to put a smile on my face. The class was a bit difficult and involved very long lectures as well as big homework assignments, but I loved it regardless. I learned so much in such a short period of time, and I was never bored. Mr. Wiemer is one of the few teachers I’ve had who actually treats his students like adults; he was always very respectful of us. The only time he really yelled at us was when he was making a point. There was never a dull moment in his class — whenever it stormed and there was thunder, he’d crawl into his podium and pretend to cry. If our unit involved Roger Taney, he’d scream when his picture came up on the projector. During our unit on the Cold War, he made us hide under our desks to protect ourselves from nuclear bombs. Our discussions were always interesting and he tried his hardest to get everyone in the class to participate, but he never cold-called students which saved me a ton of anxiety. Even the movies we watched, like Inequality For All, managed to keep my attention. If you had asked me what I wanted to do with my life at the beginning of junior year, I probably would’ve burst into tears. But thanks to Mr. Wiemer and his class, I am planning on majoring in history education. I hope that my classroom is as exciting and as positive an environment for my students as his class was for me. Junior year was rough, but Mr. Wiemer made all the difference. He’s never a guaranteed “Hi!” in the hallways and he will most likely call you ugly at some point during the year, but Mr. Wiemer is probably the best teacher at Niles West. I met Mr. Wiemer sophomore year in Model UN, had him for APUSH junior year, and I am now wrapping up my high school career with Mr. Wiemer for AP Government. At first, he was extremely intimidating. His dry, sarcastic humor can be somewhat of a shock when you first meet him, but his rough exterior quickly wears down the more engaged you become in his class. It is seldom that you find a teacher who is truly passionate about what they teach. During lessons on the Great Depression, you will find Mr. Wiemer wearing his FDR t-shirt recounting all the successes of the New Deal with a huge grin spread across his face. In government, you will find him clutching his stomach from laughter as he shows the class a SNL skit about Trump supporters. The enthusiasm and vigor he brings to the classroom is something to be envied by other teachers. Above all else, Mr. Wiemer cares for his students and on occasion, he is pretty funny. When a student is having an issue or another teacher is giving them a problem, he will listen. Having him for three years I can tell you he recycles his jokes, but after hearing them 52 times I can still give him a pity laugh. Yet stories about his twin brother, his Quaker ex-girlfriend, or times he was picked on in high school– those will never get old. 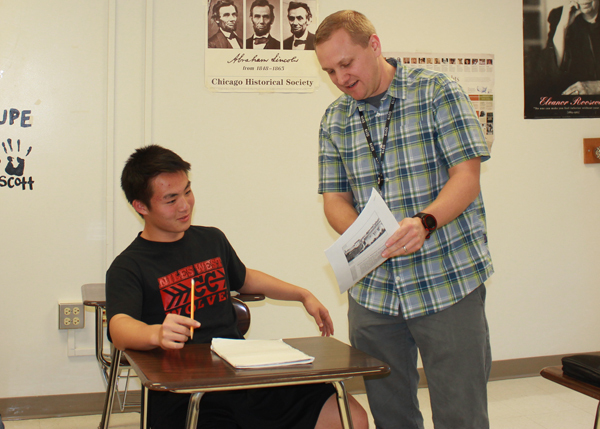 Thank you, Mr. Wiemer for being as dedicated to teaching as you are. You inspire your students to be passionate about something, may it be history or something else. The impact you have had on me these past three years extends way beyond the doors of Niles West, and I hope to see you on the campaign trail in the future #Weemz2020.